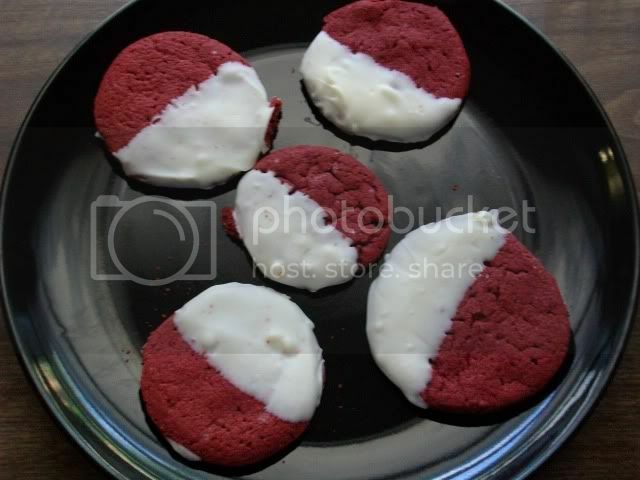 I decided to give the Duncan Hines Red and White Velvet Cookies recipe a try. Melt butter; set aside to cool. Place cake mix, egg, cooled butter and vanilla in large mixing bowl. 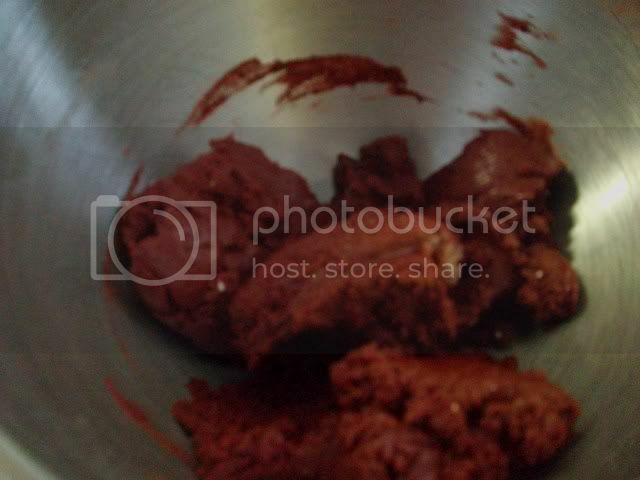 Mix by hand until well blended and dough is formed. 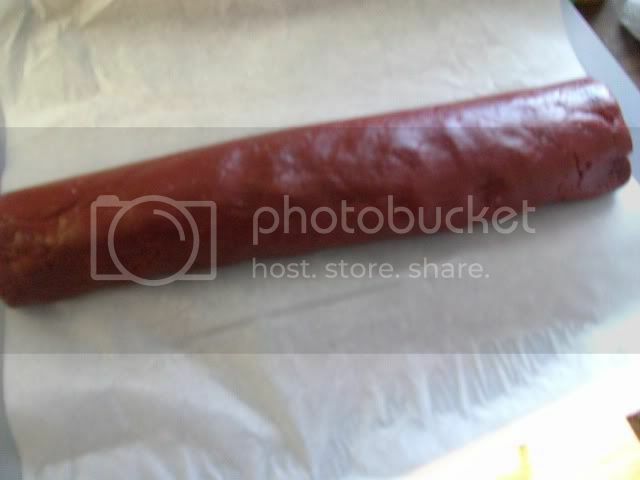 Form dough into a smooth 12-inch log on wax paper or parchment making sure it is even in thickness end to end. Wrap in wax paper; seal in plastic wrap. Refrigerate 1 hour or overnight. Preheat oven to 350°F. Lightly grease baking sheets. Unwrap dough log and set on wax paper. Using a sharp knife, cut into 48 slices about 1/4-inch thick. Place on cool baking sheets about 2 inches apart. 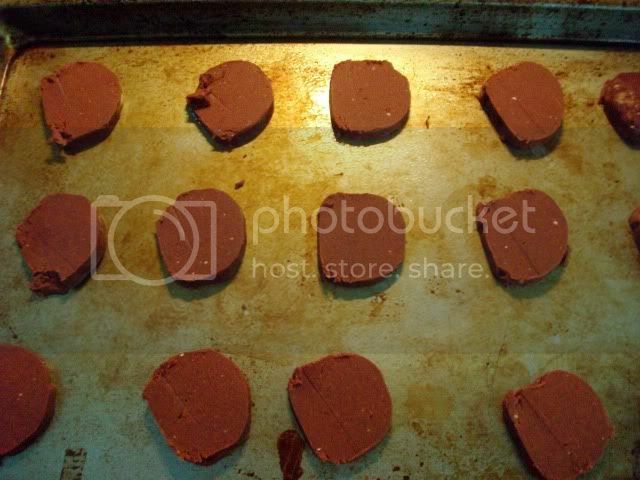 Bake, 1 sheet at a time, in center of oven for 10 to 12 minutes or until set. Cool 1 minute. Transfer to wire rack to cool completely. Make dip by placing pieces of baking bar in small, DRY, microwave-safe bowl along with shortening. Microwave on 50% power for 30 seconds. Stir to blend. If needed, continue to microwave in 30-second intervals. Blend each time. Avoid overheating. Dip each cookie into chocolate to coat half of cookie. Place on wax paper or parchment-lined sheets and refrigerate about 15 minutes or until dip is set. Store in airtight container with wax paper or parchment separating layers. For best results, bake only one sheet of cookies at a time. If two are baked at time, rotate sheets midway through baking. For variation, top white chocolate with chopped pistachios or pecans, crushed peppermint candies, crushed pretzels, praline crunch, colored sugar or other cookie decorations before it is set. Do NOT thin white chocolate with butter, margarine or water. Moisture will cause the chocolate to seize or tighten. Place melted white chocolate in a freezer-weight zippered plastic bag. Snip a very small hole from bottom corner and drizzle white chocolate over top of cookie in place of dipping half of cookie. for my cake bites I didn’t need to thin it out but when I used just white chocolate chips, it was way too thick to dip the cookies in. Lesson learned! Use either vegetable shortening or oil to thin out your melted chocolate for ease of dipping! I’d love for you to head over to the Duncan Hines site and tell me what recipe I should try next. If you have any other recipe you’d like to see featured here on Frosted Fingers, leave me a comment below or fill out the comment form. These cookies look great! I’m going to save this recipe to use on Canada Day next year (we love our red and white)! Thanks for posting Paula! Oh yummy, I don’t know why but we never get the good things like this out here. I have never seen Red Velvet in a box out here. I might have to break down and make this Red Velvet from scratch.